This Autumn, as part of our Public Goods Programme, Proboscis is inviting contributions for a new series of eBooks to be published in the Diffusion Library – Material Conditions. It will offer diverse insights by professional creative practitioners on how they see the future trajectories of culture, creativity and practice emerging. We are experiencing a turbulent period of change at fundamental levels of our society; social, political, economic and cultural changes are taking place all around us, and we face adapting our practices, routines, rituals and methods to continue to be creative and effective. Material Conditions aims to explore what it means and takes to be a professional creative practitioner – from the personal to the social and political. How and why do people persist in pursuing such careers? How do they organise their everyday lives to support their practice? What kind of social, political, economic and cultural conditions are necessary to keep being creative? What are the bedrocks of inspiration that enable people to continue piloting their meandering courses through contemporary society and culture? We are inviting contributors to share some aspects of their own practices as well as to reflect on the wider social and cultural conditions necessary for maintaining a creative practice. What now are the material conditions for being creative? How do we continue to be creative and productive everyday? What methods and practices do we use to shape our creativity? What motivations govern our continued drive and desire to make things? What are our own personal libraries of inspiration? This series aims to create a library of responses to these urgent questions: which can inspire others in the process of developing their own everyday practices of creativity, that can guide those seeking meaning for their choices, that can set out positions for action around which people can rally. Through the Public Goods programme we are seeking to map and share different kinds of ‘intangible assets’ that are precious aspects of what binds us to others, to our communities and environments; to map and share new values and ways of valuing those things which are often considered ‘small beer’. This library of inspirations aims to become a beacon for others in shaping and directing their own creative endeavours, built on top of a free-to-use platform for self-publishing (bookleteer) that in itself is a model and tool for ‘public authoring’. In addition to publishing free downloadable PDFs and bookreader versions in the Diffusion Library, we plan to print a case-bound set of each series, which will be available to pre-order online once the line up of contributors has been confirmed. We aim to publish the first series in early December 2011. If you would like to submit a proposal, please contact submissions editor Haz Tagiuri (haz at proboscis dot org dot uk) with an outline. We’re looking for contributions that explore these questions from different perspectives and through different forms such as : diaries, manifestoes, visual essays, poetic speculations, selections from sketch books, comic strips/cartoons, photograph albums, recipes or instruction manuals. About : Measure Once, Cut Twice is an examination of how an arts organisation like Proboscis produces creative collaborative artworks – specifically their ‘participatory sensing’ project, Snout. The concept of cutting is developed as a means of understanding how objects, people, and practices temporarily come together to produce exceptional moments of social engagement. Frederik Lesage is a PhD candidate in the Media and Communications department of the London School of Economics and Political Science. His doctoral thesis deals with the collective construction of artistic conventions among artists who design and use information and communication technologies. About : These 30 epithets form a kind of experimental prose poem that uses the 140 character constraint of the micro-blogging service Twitter as its structure. They were composed as a contribution to the catalogue for Larissa Hjorth’s CU: the presents of co-presence, a project exploring SMS culture. Each epithet was prefaced with the hashtag #tweetome and first published via Twitter on February 22nd 2009. This publication coincides with the Digital Cities: London’s Future exhibition at the Building Centre in London (21 Nov 2008-17 Jan 2009). Proboscis is proud to announce our first ‘StoryBox’ of digitally printed and die-cut StoryCubes: an 8 cube set printed on both sides which enables people to explore Proboscis, our projects, themes and ideas in three dimensions. We have a limited number available to buy from our webstore. This is the first of a number of StoryBoxes which we will be publishing in the next year. Future ones include creative works by sound artist, Loren Chasse; a special set on our Snout project; a 27 cube set about Social Tapestries and a new edition of the Gordon Pask cubes, first shown last year in the Maverick Machines exhibition, Edinburgh. Proboscis is now offering a service to design and manufacture custom printed StoryCubes – e.g. for marketing campaigns or communication projects – for single or double-sided cubes with as many different StoryCube designs as you like. A set of 7 StoryCubes created for Survey Sampling International Ltd as marketing tools for their offices in the UK, France, Spain, Holland, Germany and Scandinavia. About : a short eBook about Proboscis – what we do, why we do it and who we are. Proboscis are Alice Angus, Jo Hughes, Giles Lane, Karen Martin, Catherine Williams and Orlagh Woods. Design by Carmen Vela Maldonado. 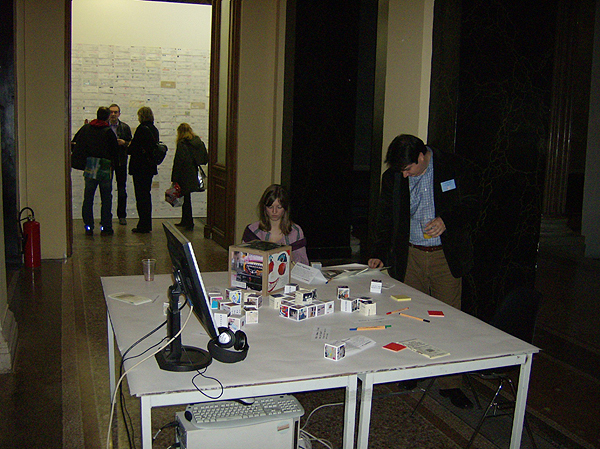 Proboscis recently took part in the ‘zoomandscale’ exhibition at Academy of Fine Arts and Kunsthalle Wien project space, Vienna. The exhibition took place alongside the Art and Cartography symposium, a collaboration between the Technical University Vienna, Academy of Fine Arts Vienna and RMIT University, Melbourne. 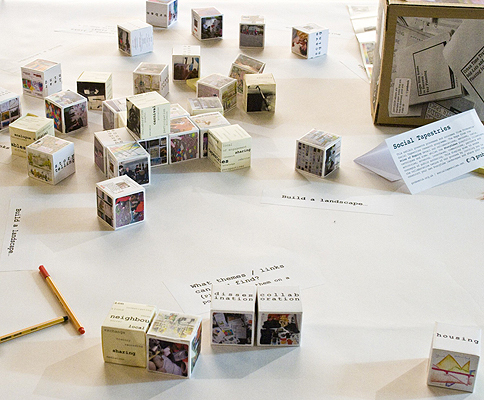 Proboscis produced a set of twenty-seven StoryCubes illustrating processes and outcomes from the Social Tapestries research programme. 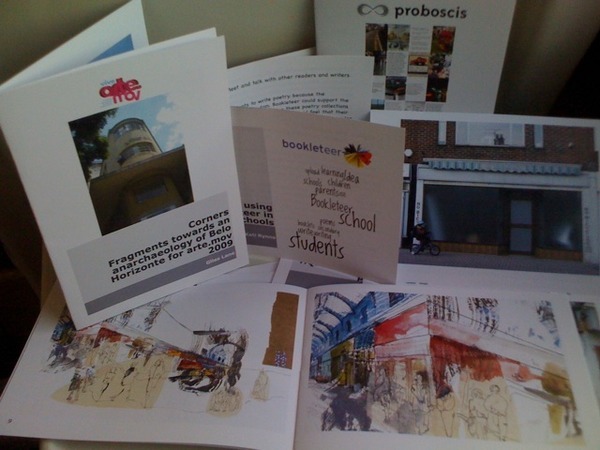 This included details of our collaborations, methods, tools, techniques and aims; as well as activities, artworks, interfaces, communities, partners and concepts of public authoring. The display aimed to evoke the collaborative nature of our process by inviting visitors to construct their own StoryCube landscapes and share their thoughts with other members of the audience. About : documentation of the outcomes from a Social Tapestries Creative Lab and Bodystorming Experience held at the London School of Economics in September 2004. Sarah Thelwall bio to come. About : documentation of a bodystorming experience workshop held at the London School of Economics in April 2004. Victoria Peckett was an LSE student volunteer on Urban Tapestries. About : an introduction to the Urban Tapestries project, originally written to accompany a talk by Giles Lane for BBC R&D in March 2004.